I’ll start off by saying that about halfway through Dear Comrade’s set, some bearded guy pulled out a piece of cardboard and a fat marker and, using an amp as an easel, began sketching. While not the most packed nor high-energy show I’ve been to (the two are usually heavily related, let’s be real), having a guy just decide you need to be immortalized on cardboard surely says something about you as a performer. I found myself at Dear Comrade’s set at Fontana’s because of two articles I wrote. (See kids, writing can get you something! A guest list spot!) The first, my Art of Song about stellastarr*’s “Jenny”, prompted Arthur from stellastarr* to contact my editor about his new gig, Dear Comrade. He sent an EP over, and I reviewed it. He offered a guest list spot to my editor, she couldn’t take it, and here I was, headed to Fontana’s. Since it was a Wednesday night, the venue was hardly filled. Two photographers got into position as Dear Comrade took the stage, and people shut up once they started hearing the twangs, bangs and rustles of a band ready to go. The experience of seeing Dear Comrade live was a little different than my expectation upon hearing the EP. The album featured more of Arthur Kremer on vocals, with Dr. Dex acting more as a duet partner, or ghostly background. (This is because the EP hasn’t actually been released, and was just a collection of the first group of mixed and mastered songs. Upon learning this, it was like curtains were drawn from my eyes.) The setup in stage was vastly different than I anticipated as well, with Dex taking front and center, and Arthur hanging out in the corner. Dex dominated the show - and I mean that in the best way possible - with a night club singer’s charisma, though at times her voice was drowned out by instrumentals due to poorly leveled sound equipment. The energy itself was lowkey, no one brought the roof down or set the place on fire, but it was totally on tempo for the band’s sound. The instrumental work was impressively tight, with very little tuning or noodling around onstage. Props must also be given to the drummer, who provided rolling intros that set you up for drama. There wasn’t much banter, as Dear Comrade chose to stick to the music, which was honestly fine by me. I love banter as much as the next girl, but when you can captivate with your music, that’s the real power. I enjoyed “In It Again,” my favorite track from the EP, but was disappointed I couldn’t hear Dex very well. 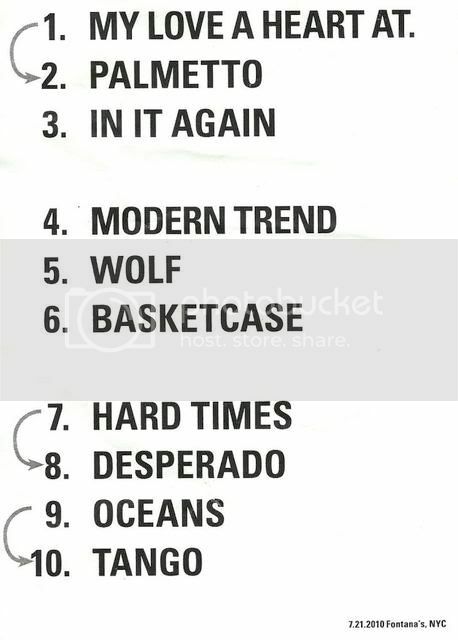 It’s a bit hard to review individual songs from the set, because, as you can see by those lovely grey arrows, a good number were medleys. Also, a good number I had never heard before, and the acoustics were not-so-hot for first-time listeners. One interesting note was that “Badlands,” the EP’s opener, was missing from the set. Maybe they’re tired of it? Oceans/Tango, the last medly, had an interesting breakdown. Dex and Arthur vocalized over low-tuned guitars and thumping beats, then they brought it up again for the end. I was ready to hear more, but, unlike any other rock band in the history of existence they finished their set on-time, thanking the audience and then beginning to assemble their gear. I got a chance to talk briefly to Dex after the show, and she told me a bit about herself. My only complaint is that she didn’t bring any cake! I’ll explain below. Dr. Dex is a “doctor of many things,” including art history, baking, and offering vocal lessons. Trained at a southern Virginia university to sing opera, she went to an open mic one night, and - infatuated with the energy and soul of bluegrass and related genres - was taken under the wing of a blues musician. After graduating college, she decided that classical music wasn’t her thing, and starting going down the path of being a blues/soul singer. She also was, at some point, a pastry chef. Apparently the good Doctor would bake cakes for her shows and cut them up and hand them out during her set. Personally, I think it’s a gimmick she may want to bring back. But honestly? When it comes to baked goods, I think Dear Comrade is more of a rich chocolate mousse tart than a frosted sheet cake. Click here to hear “In It Again,” my favorite track of the unreleased EP. 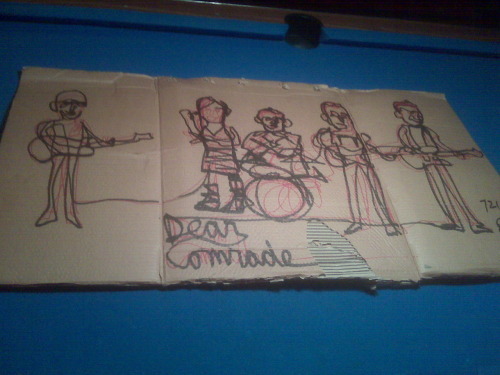 I wanted deeply, in my heart of hearts, to not compare Dear Comrade to stellastarr*. But I truly think, even had I not known that Dear Comrade is the work of stellastarr* drummer/keyboardist Arthur Kremer (with the help of Emmett Aiello on lead guitar, bass by Dan Freeman, and backing and occasional lead vocals by Stefani Peikin - who also goes by Dex, and Dr. Dex, though I doubt she’s board certified), my mind would have immediately leapt to that conclusion. Moody instrumentals, soaring female backing vocals behind almost-speaking-rather-than-singing post-punk male vocals (think almost Interpol), yeah, I could be describing either band. But while stellastarr* began reaching out toward what I would argue is a more gothic sound (in the literary sense of the word) with Harmonies for the Haunted, Dear Comrade is a little less flashy, more stripped down, and attempts to show a broader mix of influences. “Badlands” opens the album, a semi-political track mostly about apathy. “Conflict of interests, clashing of faith / What would John Lennon fight for today? / Where’s the amber, where’s the glow / Where’s Black Panther, I just don’t know.” While I assume Kremer is referencing the 1960’s radical party, he could just as easily be asking for the Marvel Comics superhero. Oh, the joys of interpretation. The track itself is certainly enjoyable, but I think it lacks a certain spark, especially when compared to later tracks on the album. “The End” is next, a duet between Kremer and Peikin. A gritty exchange of pain with emotionally charged gusts of chorus, it unfortunately lacks suspense. However, “In It Again,” the third and middle track of the EP, is where I feel like things really open up. This is a song that is sung mainly by Peikin, and she lets the listener feel her vocal prowess. Easily the catchiest tune, it has “single” written all over it. Kremer’s drums provide a heartbeat that propels the music, and while certainly worth noticing, they are not overwhelming, and that can often be a fine line. The very end of the song, which features a few seconds of only Peikin and the drums, unlocks an interesting potential which I think could be explored more, perhaps on a later album. What I would have given for a drum-and-vocal hidden track. Next time, guys? “My Love a Heart Attack,” which follows, features a pleasing Spoon-like chorus, but the unnecessarily reverbed, almost dance-track intro confused me. The back-and-forth between Kremer and Peikin hits a peak, with Kremer keeping the bassline and letting Pekin do her thing. 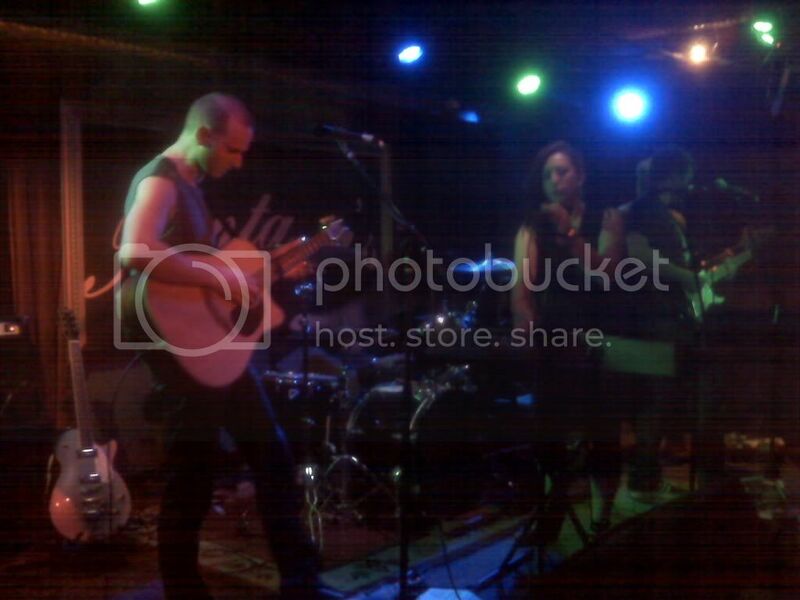 The EP closes with ”Oceans”, which is the most stellastarr*-esque track on the EP. I have no problem with this, as I’m sure being in stellastarr* has taught Kremer a ton, and to show off what he’s known for is only fair. The track reaches almost Meatloaf-level operatics, with ringing bells and echoes. It’s very pleasing in a “put this on and strike dramatic poses alone in the apartment” sort of way. I can’t be the only person who does that. Ending with a steady drum pound, the less-than-15-minute-long EP begs to be played again. So do it. Let me know what I missed.